Comedy's a rough business and, like any line of work, to reach the top and to thrive there for an extended period of time takes a lot of grit, persistence, and dedication. 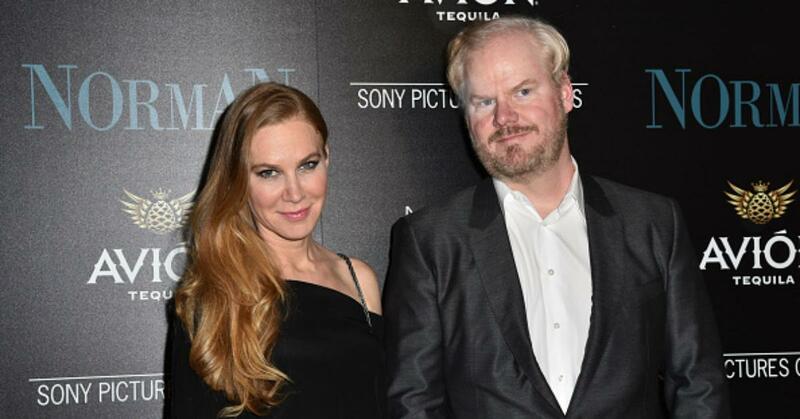 There are some comedians who are lifers, and Jim Gaffigan's one of them. I've been watching his stand up since I had braces and now, years later, married with a kid, I found myself sitting on the couch watching his new Netflix special, Cinco. To imagine someone like Gaffigan would ever stop being a comedian seems kind of alien because I can't really imagine him doing anything else...And that's more of a testament to his craft, not to my lack of imagination. But the professional funnyman revealed in a recent interview with The AV Club that he almost bowed out of the comedy game entirely. Another "enjoyable" and "relaxing" meal with my "children". His wife and co-writer, Jeannie, was suffering from some headaches and fatigue for a few months, something she chalked up to dealing with five kids on a daily basis. But when the problem persisted and her hearing started to go, she decided to finally visit a doctor to see what was up. Tests revealed that there was a benign, pear-sized tumor that had wrapped around her brain stem. The surgery to remove Jeannie's tumor was successful and now she's on a slow, but thankfully steady, road to recovery. The comedian opened up about the experience. One of his biggest takeaways was a restored faith in humanity. "I live in New York City, but it doesn’t matter if you’re in any large, metropolitan area, there’s kind of a little bit of survival-of-the-fittest, so when you encounter kindness or people going out of their way in an empathetic way, it’s almost startling. It’s like, “What do they want from us?” Encountering the empathy of people from nurses to people that organize appointments… when people are kind, you really have a sense of appreciation for it. Granted, there are always some jerks along the way, but I guess I’m just kind of surprised at how, you know, you expect your family to step up, you’re grateful that your family and friends step up, but when other people go the extra mile, that’s when you sit there and go, “All right, maybe human beings aren’t monsters." Jim is known for being extremely family-oriented, so he's been juggling being a primary caretaker for his wife and his stand-up career. After his wife's surgery, despite having a new Netflix special out that he was supposed to be promoting, Jim has taken up the role of caring for his wife, cancelling events and shows. His Cinco album, which will include commentary from Jeannie, was also delayed as a result. The ordeal left him with a very real fear: that he'd outsource the raising of his children in the event of the worst-case scenario. I would say that there was, like, a good week and a half there where I was like, “Okay, so I’m retiring from stand-up comedy because I don’t want to outsource my kids to be raised by someone else.” I had a conversation with my manager, and I said, “Look, I just want you to know,” and I had a conversation with Jeannie like, “I’m not interested in, ‘Jim goes off and does his thing and sees the kids on Mondays.’” I wasn’t about to do that. So there is something about where we stand today, where the stand-up’s not important, and not only did I almost lose my wife and writing partner, but I was sitting with the reality that I probably wasn’t going to go on. But Jim also pointed out that even two hours after Jeannie had her surgery, she was already coming up with tumor jokes. How lucky I am to be alive right now! Repost @jimgaffigan with @repostapp ・・・ Written by @TheClassicMar & her Uncle @Patrick_Noth while @jeanniegaffigan was in the hospital. Featuring @jackiswizard, @kookoolaru, Mikey and MiniMe-Pat. Check out @patrick_noth On youtube https://www.youtube.com/user/lukeflytalker for more amazing videos like this "Daddy, if you know @Lin_Manuel you have to get her to watch this.” - Katie, my 8-year old daughter. It is also kind of what we do. Whether it’s working on the show or my stand-up or writing our book, it’s our defense mechanism. It’s therapeutic, but it’s also weird, because I immediately came up with some tumor jokes and was running them by her. There are certain things where I think a lot of people would be like, “That’s way too soon,” but look, Jeannie went in for this two-hour MRI, and she came out and the first thing she said was, “Write down these ideas.” So I suppose it’s therapeutic in a way. You can check out the full interview here. It's a really interesting read and touching look into the lives of a couple of comic geniuses who just happen to be married. Thank you so much for the prayers, & flowers. Thanks to @karenbergreen for my plush brain. Thinking about a spouse or loved one with a life-threatening illness is scary enough, and talking about it even more so. To be able to do so with honesty and humor is downright beautiful.